The above map shows new congressional district boundaries, approved earlier today by the 14-person Citizen Redistricting Commission. The nonpartisan commission also redrew the borders for state senate, assembly and Board of Equalization districts (see the full maps here), but it's the Congressional map that's most newsworthy to us here on the North Coast. Why? 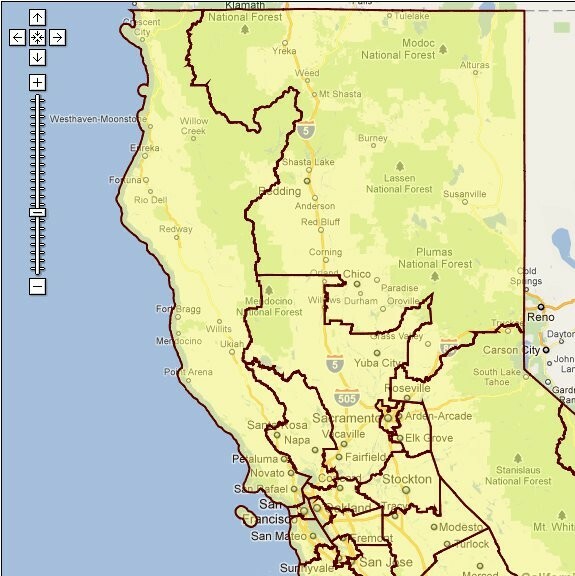 Because, as predicted, Congressman Mike Thompson's home of St. Helena has been excised from our district (along with Clearlake, Napa and Davis) in favor of hoity-toity Marin County (see the before and after maps here). Reached moments ago, Thompson's communication director, Caroline Hogan, said the longtime First District representative is waiting for the Redistricting Commission's final vote on Aug. 15 before commenting on the maps. Even then the redistricting shuffle may not be final since residents can challenge the new boundaries in court or by referendum, which could drag on for months or years. At the press conference announcing the vote today, a commission member confidently asserted that they'd followed the criteria set forth in the California Constitution, studiously ignoring political party affiliations and concerns, and that the commission is confident the maps "will prevail against any and all legal challenges." As pointed out over on the Lost Coast Outpost, a state congressman doesn't actually have to live in the district he or she represents. Might Thompson choose his coastal friends over a now-landlocked Napa wine country? Seems unlikely, but for now he's not saying either way. Humboldt County still falls within the district boundaries of State Senator Noreen Evans (D-Santa Rosa) and Assemblyman Wesley Chesbro (D-Arcata), though their respective political landscapes have shifted somewhat, with Evans' district picking up Marin and Del Norte counties and Chesbro's acquiring a hunk of Santa Rosa. Today's Los Angeles Times has a good overview of the entire process, including a quote from Eureka fisherman David Bitts, who weighs in on the longstanding tug-o-war between fishermen and inland potato farmers over the water of the Klamath River. He urged the Redistricting Commission to keep the districts oriented north-south, rather than lumping us in with the Central Valley. "However you slice it, the North Coast is going to be the tail of its congressional district just because of population," Bitts says. "I think, speaking for the tail of the dog, I'd rather be wagged by a breed that I at least recognize."